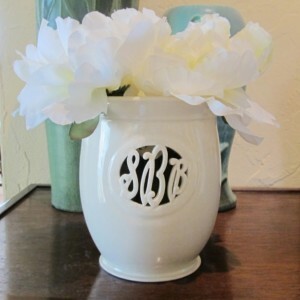 This is a cursive font version of the smaller of the two monogram vases and can be for a couple or for an individual. I've also had these ordered as gifts for the bride's mothers and for the bridesmaids. If you prefer your monograms in block lettering please see all that Maid of Clay Ceramics offers by viewing the rest of my shop. You have the option of having the name(s) and/or wedding date inscribed on the bottom of the vase, OR you could have a special message from you e.g. Happy Birthday, Congrats, Best Wishes, Love XXXX, etc. Please leave the pertinent info at checkout: The order of the intials, and any message/date you\'d like inscribed on the bottom of the vase. 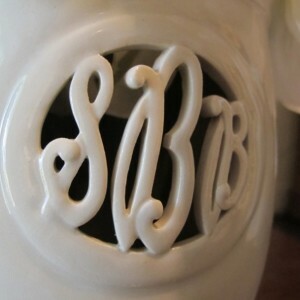 With the couples monogram, it is the bride's first initial, the surname initial, and then the groom's first initial. For an individual, it is the initial of the first name, the surname, and then the middle name. 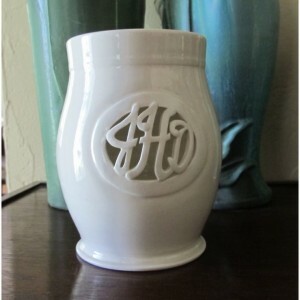 This vase will be approximately 5-1/2" high and will be a lightly speckled ivory cream color. 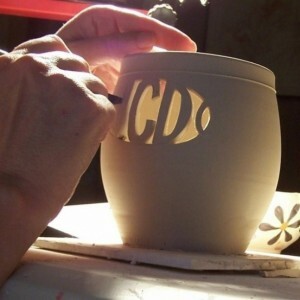 This has a lead time of 4 to 6 weeks, so please keep this in mind if ordering for a wedding gift. Canada shipping is less expensive that the rest of international shipping and will be refunded the difference via Paypal. ********************************** PLEASE NOTE: I'm just giving advance notice that I will be removing the custom wedding vases from the shop starting November 1, 2013. I will relist them starting January 2014. If you need one for a wedding or Christmas gift during that time please order prior to November 1st. Thanks! !